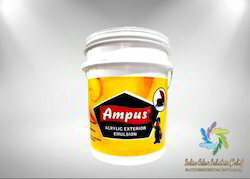 Spotted as a top manufacturer and supplier, we offer Ampus Exterior Emulsion to our clients. In adherence to set industrial standards, our offered range is available in wide assortment so that our clients can choose the product as per their requirement and need. Our clients can avail the product in best pricing as per industry standards and norms so as to keep the expectations of our clients up to a standard level. Our steady growth has helped us to move to the pioneering position. Indeed, our technology oriented infrastructure equips us to empower our diligent workforce. This ultimately facilitates us to develop exceptional quality products and to gain recognition of market leaders. Moreover, we believe our innovative approach is the key differentiator in our operational excellence, which helps us to focus with deepened dedication about the evolving client needs. We translate these creative endeavors into strategic business practices by leveraging advanced technology to bring forth best in class enamel and paints that provide superior coverage and long lasting performance.